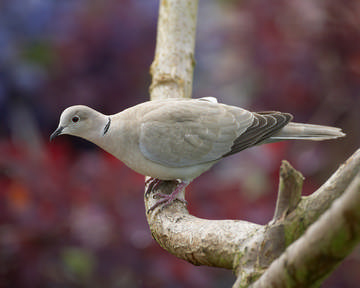 It bears repeating that Collared Doves were not recorded in the county until 1960, with first breeding suspected in 1961 as part of their remarkable spread to the northwest from Turkey and the Balkans that started in the 1930s. Most of Cheshire and Wirral had been colonised by the time of our First Atlas, but this Atlas map shows some further expansion with a net gain of 44 tetrads with birds present in the breeding season. The ‘change’ map shows that there is probably no significance to the 26 tetrads from which they have been lost, but they have filled in almost all of the odd gaps across the county, with a notable cluster of newly occupied tetrads around Macclesfield in SJ97. One of the factors that helped its expansion of range is that it encountered no opposition and has been able to exploit a vacant ecological niche for a medium-sized granivore tolerant of man. The Atlas habitat codes show 72% of records in human sites (5% urban, 19% suburban and 48% rural), with 14% on farmland, 10% in woodland and 3% in scrub. This is not a bird of dense woods, however, and most of the woodland records are from thinly wooded sites with adjacent fields or urban greenspace in which they feed. Their spread has also been helped by a high reproductive rate. Birds often start nesting in February, or March at the latest, and some carry on into October. They quickly build a flimsy nest and their clutch of two eggs takes only about 16 days of incubation, with chicks fledging about 18 days later, unusually short periods for a bird of its size. Many birds shorten the cycle even further by laying a new clutch whilst still feeding dependent young, allowing most of them to have three broods a year, and some pairs as many as six. They have taken advantage of our horticultural preferences in their nesting, with leylandii hedges probably their most-used sites, and fieldworkers recorded other examples of their exploiting man, including a nest in April 2006 at the Cheshire Oaks shopping complex (SJ47C) and nests in two tetrads on houses supported by the bracket holding a satellite television aerial. Observers reported nests in 201 tetrads, with the remainder of the confirmed breeding records coming from recently fledged youngsters. Whilst they are in the nest and for a few days after, both adults share the task of feeding their brood with ‘crop milk’, also known as pigeon's milk, a secretion from the lining of their crop that is rich in protein and fat. Of the 225 tetrads with probable breeding, 133 of them had pairs recorded, 33 arose from surveyors seeing birds with nesting material or visiting an apparent nest site, and 59 from nuptial display, a male flying high into the air and stalling, dropping with closed wings to impress his mate and deter other doves. The BTO BBS analysis shows that the breeding population of Cheshire and Wirral in 2004-05 was 26,650 birds (19,430-33,880), an average of 44 birds in every tetrad in which they were recorded. The national index shows an increase of 61% in the twenty years from 1984.